Let me begin this post by saying if you ever end up in Cheyenne, WY, you absolutely should go to Mort’s Bagels for breakfast. While they aren’t New York bagels (my NY bagel connoisseur husband would like you to know that), they are still delicious and a definite great start to the day. I had a sausage, egg, and cheese sandwich on a garlic bagel; Max ordered a “Wyoming Sunrise” which was avocado, onion, and tomato on a green chile bagel. The coffee was pretty decent and the bagels were a perfect way to feel like I was ready to get going without feeling incredibly full. 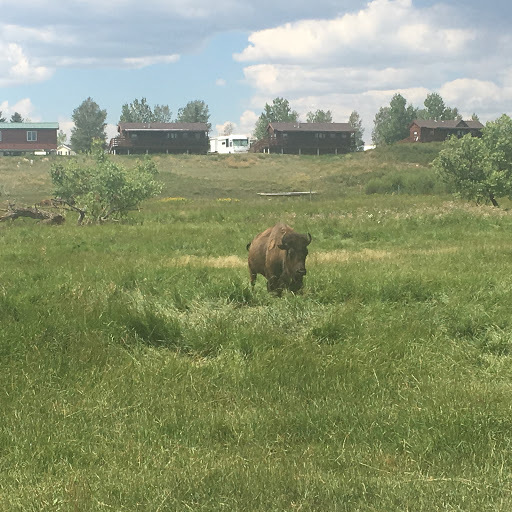 Just south of Cheyenne is a big ol’ bison ranch. 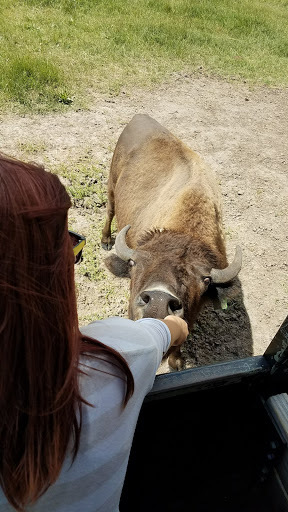 I got unreasonably excited when Max suggested we go and pet/feed some bison – I am actually just a giant kid at heart, and as a University at Buffalo graduate I have an irrational love for bison/buffalo. 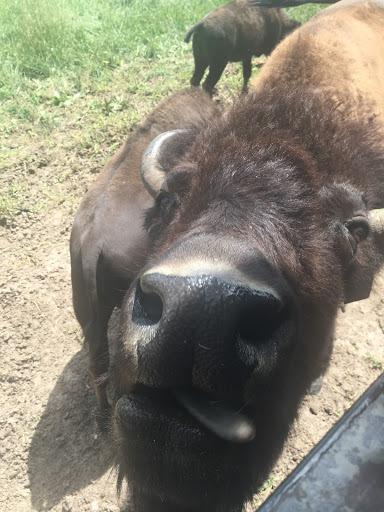 So we drove the nine miles to Terry Bison Ranch, another place where I was completely out of my element, and bought some tickets to the train ride where you get to feed the bison. 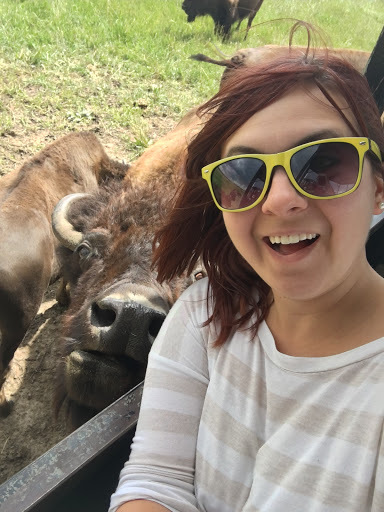 We didn’t check the train times before we came down, so we had about an hour to kill before we got to feed the bison. 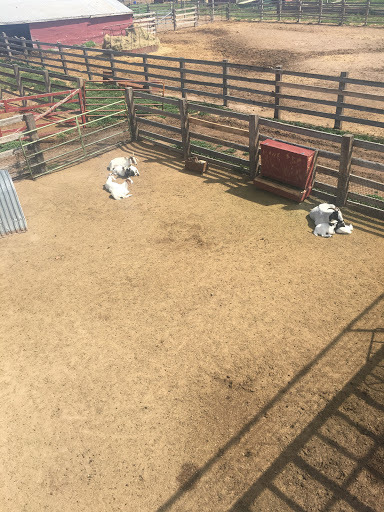 Luckily, there are plenty of other animals there, such as tiny Li’l Sebastian horses, alpacas, camels, ostriches, pigs, and BABY GOATS. And then we got to take the train out to the bison herd. 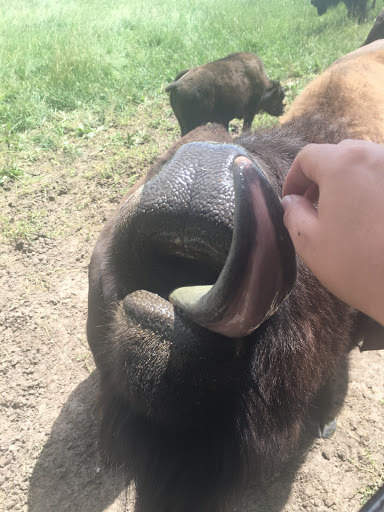 I was SO EXCITED at the prospect of petting some bison. Until they told us not to pet them, just to feed them (I pet a couple anyways, sorry not sorry). 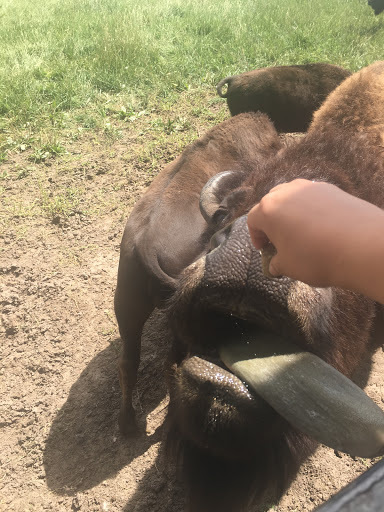 The train conductor explained the process of feeding a bison – you have to put the food right on their tongue because they have awful eyesight and they will pretty much put your entire hand in their mouth. We left the train station with rousing cheers in response to “you all ready to get your hands slobbery? !” which is maybe the only time in my life I’ve been excited about animal spit. The ranch saddles the Wyoming / Colorado border – we had been joking the whole time that Max was doing everything in his power to keep me out of Colorado since we’d been mere miles from the border for a couple days and I am trying to knock out as many states as I can on this trip. So when the train crossed over for a brief turn into Colorado, I was thrilled. Even though we were planning on driving down to Fort Collins later. Still counts. Shortly thereafter, we arrived at the bison herd. 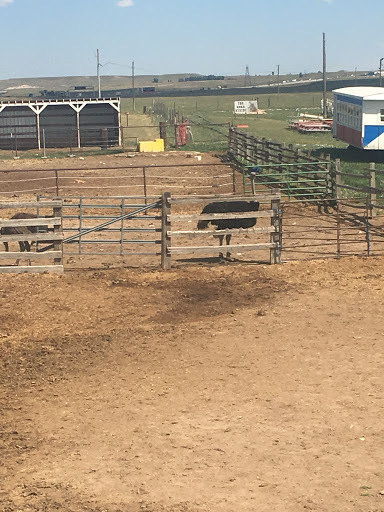 The punks weren’t paying attention, apparently, and the conductor had to call someone at the main barn to get the bison to move. They walked right up to the train. Now, they are still HUGE, but the bison were so much smaller than I expected them to be. Bison are also incredibly cute, which is a weird statement to make. They were all very friendly and super excited to eat – almost as excited as I was to feed them. 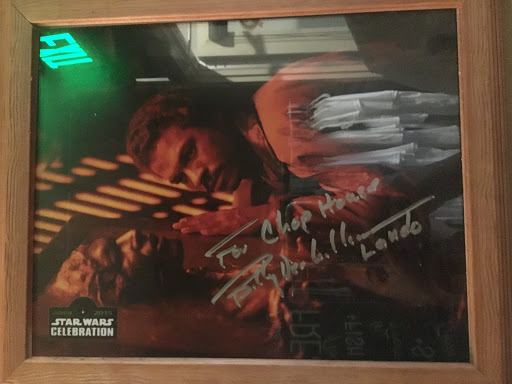 I was a giddy little kid about the whole experience. It was so, so cool and I highly recommend doing it (but bring hand sanitizer with you). A storm was quickly approaching, so we started our trek back to the station – as it started downpouring. It was COLD and unpleasant, to say the least, so when we got back on the train we immediately headed for the restaurant to get some lunch and warm up. 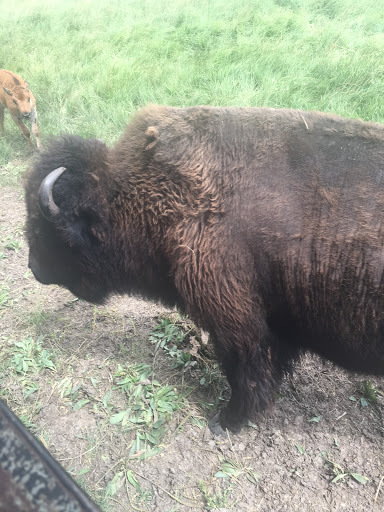 The irony was not lost on us – here we had just been feeding bison and now we were about to eat some – but it was delicious and worth it. I got a bison chili, my favorite mode in which to eat bison, and Max got a bison burger. 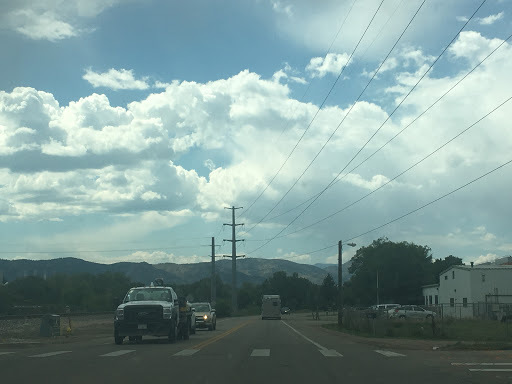 Once it cleared up a bit, we started the next leg of our journey down to Fort Collins, Colorado, to go to the New Belgium brewery. 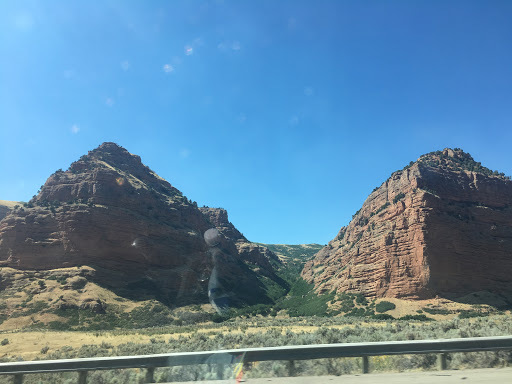 If you’ve been following this blog, or if you know anything about us in real life, you know we are beer lovers and so when we realized how close we were to New Belgium we had to squeeze it in. And it was great. 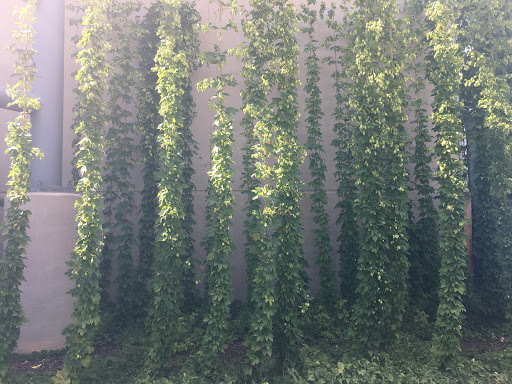 We managed to get on the brewery tour, which we didn’t have reservations for but I HIGHLY recommend getting a reservation and doing the tour if you plan to come to New Belgium. I have been on my fair share of brewery tours and this was one of the best ones. We got to see all the normal things you see on a tour – the stills for the mash/wort, barrels for aging the lambic, where the canning process takes place, etc. 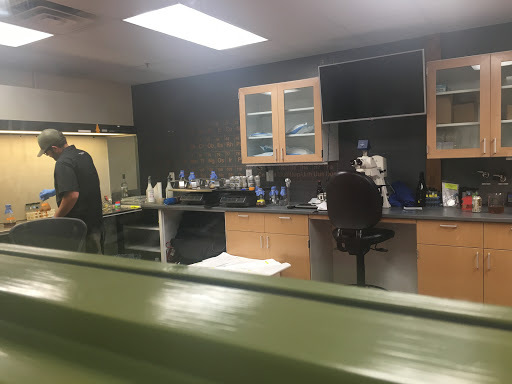 – but also the science lab where they do chemistry work when creating a new style, where the hops are growing, and our guide grabbed us some cans fresh off the canning line. 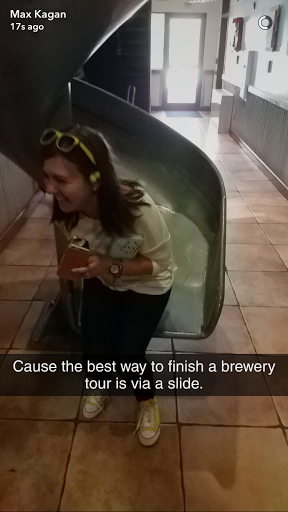 Oh – and we got to complete the brewery tour by going down a slide. SO FUN. We hung out for a while, finished our beers, and drove around Fort Collins for a bit. 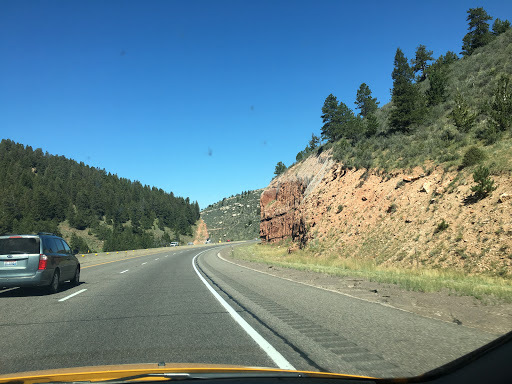 I will admit that my research into planning this trip, after it was determined that we wouldn’t be able to go to Denver, was mostly just “cities along I-80” and once we decided on the distances we were willing to drive each day, Cheyenne was the one we picked. If I had put a little more time into researching our stops, I probably would have wanted to stay in Fort Collins instead. But – you live and you learn. Fort Collins was a pretty cool little city and I want to visit again when we actually have some time to spend there. We closed out our Cheyenne adventure with a trip to Baskin Robbins, because we are adults, a hotel breakfast in the morning, and a long day of driving ahead of us. 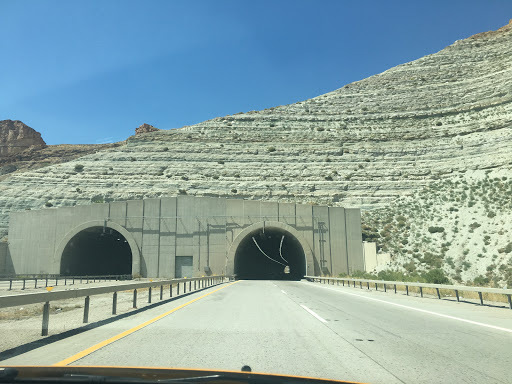 I-80 through Wyoming is mostly incredibly boring, but the few views we were able to see were pretty incredible – especially as we crossed over into Utah. 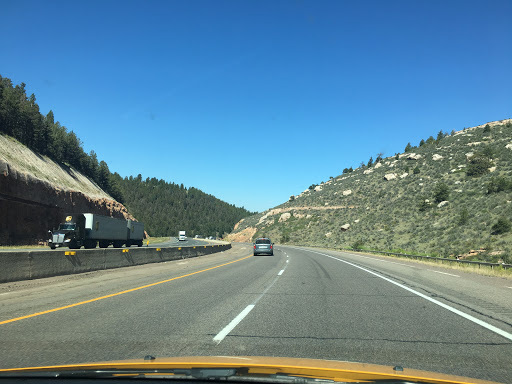 Plus we crossed the Continental Divide which was pretty cool. 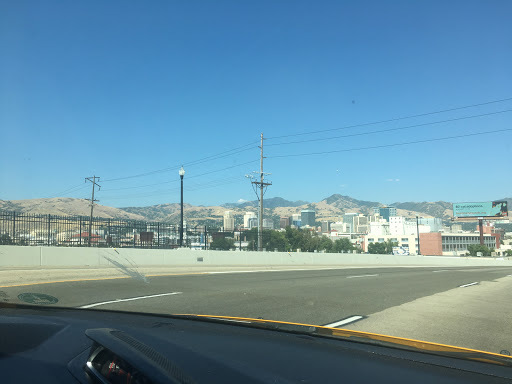 Salt Lake City is nestled in a valley, and the views coming down into the city were incredible. 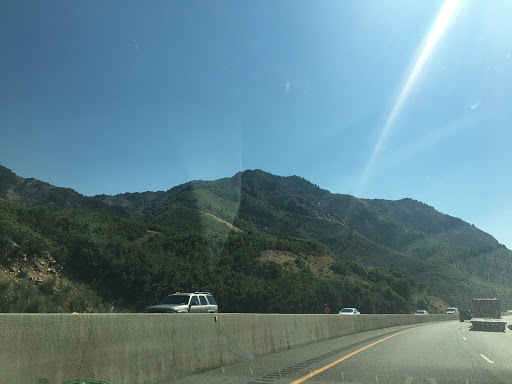 But I’m getting ahead of myself here – SLC is yet to come. This post is about Cheyenne. 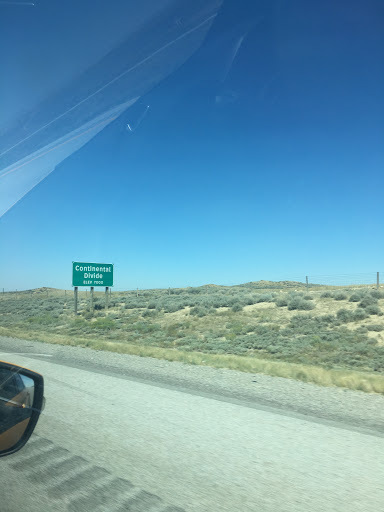 😉 Cheyenne was cool, not someplace I’m in a rush to go back to, but it was a very eye opening experience for me to see a small Western city and a way of life that is so, so different from what I’m used to. And that’s what traveling is supposed to be about, right? 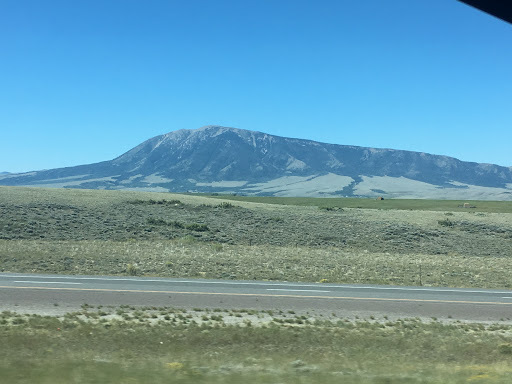 You learn from being out of your element, and Cheyenne reminded me that there’s a whole lot of this country I’ve never seen and never experienced anything like it. So thank you, Cheyenne. I may have been a little hesitant about you as a city, but I appreciate the experience, even though – and maybe especially that – it wasn’t something I expected or was prepared for. Travel is always life-changing, just not always in ways you’re ready for. See y’all in Salt Lake City. Posted on August 20, 2017 January 14, 2018 by DaniPosted in road trip, travelTagged activities, animals, beer, brewery, cheyenne, colorado, fort collins, outdoors, restaurants, road trip, travel, wyoming.